Wärtsilä has submitted its Aquarius Electro-Chlorination (EC) Ballast Water Management System (BWMS) for US Coast Guard (USCG) Type Approval (TA) after successfully completing all the testing procedures required. 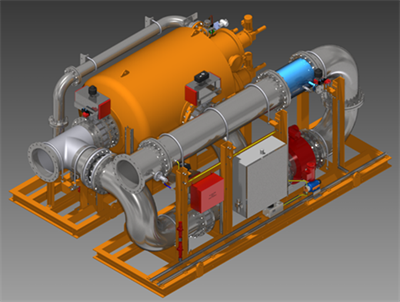 Wärtsilä received type approval from the International Maritime Organization (IMO) in 2013 for the Electro-Chlorination system and the same successful design was used for the USCG application. This current testing has again proven the consistent performance of the Wärtsilä solution, and demonstrates the high reliability, robustness and effectiveness of the system. “Achieving this significant USCG testing milestone is a major step forward for the product. It provides customers with further assurance that this system efficiently addresses ballast water treatment compliance needs, with a reliable product and a partner committed to long-term global support,” says Joe Thomas, Director, Ballast Water Management Systems at Wärtsilä. The Wärtsilä Aquarius EC BWMS utilises proven filtration and electro-chlorination technology, while maintaining a high degree of safety, operability and reliability. It ensures compliance with regulations, even with varying levels of water quality. Safety has been a fundamental consideration in the design, and hazard analyses aimed at eliminating installation and operational risks have supported its development. The Wärtsilä range of ballast water management systems is backed by Wärtsilä’s global service network. Wärtsilä also offers a BWMS using filtration and ultra-violet (UV) irradiation. The Wärtsilä Aquarius UV system is type approved according to the IMO Convention and has an Alternative Management System (AMS) acceptance certificate from the USCG. It is currently undergoing full USCG TA testing with completion expected during 2018. The Wärtsilä Aquarius UV is also certified for installation in hazardous areas (EX).